Lorraine Bracco is one of the world's most dynamic actresses, but when she reached her fifties, she felt she was losing her luster. During the long illnesses of her parents, she began to gain weight and felt her energy and self-confidence take a dive. Watching her parents die within 9 days of each other was her wake-up call to take charge of her life. She made a commitment to herself to stay healthy. 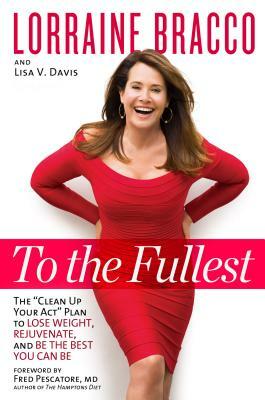 In To the Fullest, Bracco presents her Clean Up Your Act Program, a comprehensive plan to help women over 40 look and feel younger. The program includes an intensive liver cleanse to reboot the body to start fresh on the path to optimal health by eliminating gluten, sugar, eggs, and dairy. Two weeks of meal plans and a varied list of meals and snacks illustrate that hunger is not part of the program and that eating clean has endless flavorful options. Her Clean Up Your Act Diet, which follows the cleanse, will help you lose pounds and deliver supercharged energy. Bracco adds her own mouthwatering recipes to ease the transition to clean eating and suggests an abundance of satisfying breakfasts, lunches, dinners, and snacks. She gradually lost 35 pounds and has kept it off. The book also includes testimonials gathered from women who have participated in Rodale's 6-week test panel. With winning honesty, Bracco provides the perfect combination of humor, comfort, and motivational support that women need to rise to life's challenges. From attitude adjustments to style tips, from finding new passions to making movement a habit, her advice and personal insights both inspire and entertain. Lorraine Bracco has appeared in countless films (Goodfellas), on television (The Sopranos), and on Broadway. Currently she stars in TNT's smash hit Rizzoli & Isles, playing the Rizzoli family matriarch. She was recently named Woman of the Year by the New York City Police Athletic League, and is launching her own line of supplements. She published a memoir, On the Couch. Bracco splits her time between New York and Los Angeles.